Nearly one quarter of all Boston bicycle accidents that result in injury are caused by vehicle drivers or passengers opening their doors into the path of an oncoming cyclist. It’s called “dooring,” and in addition to accounting for a significant number of the total number of bicyclist injuries in Boston, it’s blamed for 40 percent of all cases where a driver is at-fault for injury to a bike rider. It’s also illegal, per Mass. Gen. Law Ch. 90, Section 14. This statute makes it clear that it is the vehicle occupant’s job to wait to open the door until it’s safe to do so without interfering with other moving traffic – which includes both cyclists and pedestrians. And yet, these incidents continue to happen, as as bicycle safety advocates note, it has largely to do with the fact that bicycle traffic is still something of an afterthought – if it’s a thought at all – to many American drivers. In the Netherlands, as noted in one New York Times article, it’s far different. Cycling is ingrained into the culture. Everyone cycles. While many cities in the U.S. – including Boston – have dedicated bike lanes for safer bicycle travel, in the Netherlands, bicycles are truly seen as equal vehicles, with not just dedicated lanes, but dedicated traffic lights, parking garages and depots. Dr. Michael Charney gave up driving a car in 1992 in favor of cycling. He hopes the “Dutch Reach” practice could catch on here – maybe someday, like in the Netherlands, becoming a part of the required skills that must be mastered on the statewide driving test. Still, he understands that could take some time. At this juncture, he is simply trying to spread the word, hoping drivers pick up on the practice voluntarily. After all, drivers have a lot at stake too. Violation of this statute carries a $100 civil penalty, but drivers and other vehicle occupants could find themselves in a far deeper financial hole if they are sued by the cyclist. 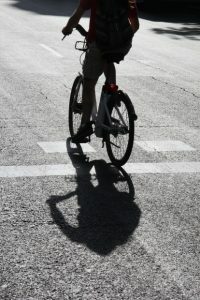 As our Boston bicycle accident attorneys know, a “dooring” citation could be used as evidence of negligence per se, which is when the act is assumed negligent because it was in violation of the law. Charney’s efforts gained steam last year when a 27-year-old female cyclist was killed in Inman Square over the summer in a dooring incident. After she was struck by an opening Jeep door, she was tossed into traffic, where she was run over and killed. Soon after this, he conducted research and sent his findings to local police in Somerville. Soon after, electronic signs carrying this message began to appear. He’s also gotten the support of the Massachusetts Bicycle Coalition (MassBike) and the Somerville Bicycle Committee.